Battle spam through the use of a disposable email address.–PC Pitstop. 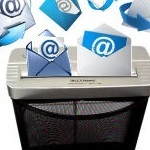 Do You Need a Disposable Email Address? You can have one disposable email address for every entity that requires an email address, if you like. Then if spam starts coming from a given disposable email address, you can be pretty certain who’s responsible. It’s possible that a spammer just randomly generated an email address that matched one of your disposable email addresss, but it’s MUCH more likely that the entity to which you gave the disposable email address shared it with a spammer, willingly or by theft. Having narrowed down the security leak to one entity, you can investigate and decide whether to give that entity another disposable email address or steer clear of it. Bob Rankin email spam. permalink.